WASHINGTON: Cheap Hotels in the Nation's Capital - Washington D.C.
Where else in the country can you get catch a glimpse of a 19-foot President Lincoln, tour a spy museum, and step foot in the most important residence in the U.S? Washington D.C. is a living history book, and CheapRooms.com has plenty of cheap hotels that will put you right in the middle of the story. Washington D.C. is a living history book. America's past and present are honored across the many in attractions and monuments on display in the city. Where else in the country can you get catch a glimpse of a 19-foot President Lincoln and step foot in the most important residence in the country? Washington D.C. provides a lesson in history for all of its visitors. You can read the original US Constitution, view critically-acclaimed art, and sit at the foot of the Washington Monument. The city's list of important attractions to see is long, to say the least. You need to be based in the city-center to maximize the time you can spend exploring. The Carlyle Suites, an elegant eco-friendly hotel, or Hotel Palomar, a refined downtown boutique hotel, are fantastic options. Both of these luxurious properties are located in the historic district of Dupont Circle. This area puts you in close to the most famous address in the world, the White House. Tours of the iconic, political landmark can be arranged ahead of time and there are plenty of other attractions to explore in the meantime. The National Gallery of Art, the US Botanical Gardens and the US Holocaust Memorial Museum should be among the top of your must-see list. Reserving a room at the Savoy Suites in Georgetown will give you easy access to all of these. If you want to show your kids the most important structures in Washington D.C., start at the National Mall where you can experience the Thomas Jefferson and World War II Memorials. And nobody should miss the Martin Luther King Jr. Memorial. Nature and animal lovers will want to visit the National Zoo, which is located in an area brimming with great hotels like the Embassy Suites D.C. Metro. 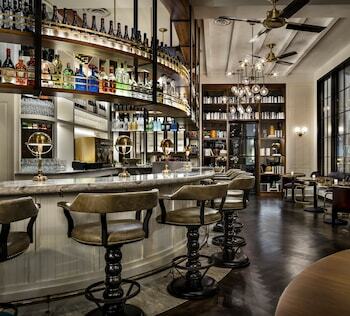 If you're looking for an eco-friendly hotel, book into the Hotel Monaco. 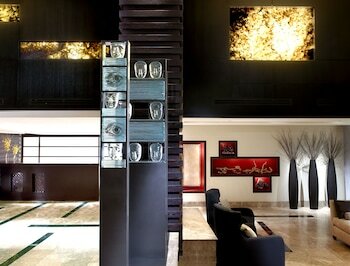 This luxurious boutique hotel also puts you close to the Smithsonian National Air & Space Museum. Every attraction in Washington D.C. has importance and significance in America's past and present. There's too much to see everything in one trip, so rather than rushing, save some for your next trip. Let CheapRooms.com help you find your next hotel in Washington D.C.
We all love going to a new city and discovering all the well-known tourist hotspots. But some cities are so good they have stuff the tourists love - and a whole bunch of stuff the locals adore. First call is to find decent accommodation at very good prices so you can see the museums - and all the stuff the locals love too. You're undoubtedly here for a little culture - but there are off-the-beaten track options too. Studio galleries such as 87 Florida 87 Florida, Pleasant Plains Workshop, and (52 O Street Studios) are enthusiastic, passionate places to visit and they're generally home to less well established artists - who may well be the next big thing! Give yourself a morning to make a 30-minute walk (from the Capitol dome) to good old Capitol Hill neighborhood where the Fridge, a little cosmopolitan space in an alley near Eastern Market stands ready for you to explore. Across town, walk along 14th Street NW in the U Street and Logan Circle neighborhoods and you'll come across a smattering of eclectic galleries, including the Hamiltonian Gallery, Project 4, Gallery Plan B, Contemporary Wing, Transformer, Curator's Office, Hemphill, and the Adamson Gallery. If you're looking for a little nachtmusik, DC's largest musical zone is the intersection of 14th and U Streets NW. This is the epicentre of DC cool and it shows in the people who wander through. Still, The 9:30 Club, the place many musicians rate as one of the best live venues in the United States, is five blocks east, and the Black Cat, a much-loved local institution, is three blocks south. Several of the capital's newer, plummier nightspots are centred in the same general area, all a short walk from the U Street-Cardozo Metro stop. Drinking in a rooftop bar is not only a great way to see what a city's pretty young things are up to, it's also a great way to get a view across the sparkling metropolis you're happily imbibing within. First, see cheaprooms.com to find the perfect hotel in Washington DC to suit your needs and your budget. Staying close to the National Mall area is ideal - you're close to all the action and the rooftop bars are within striking distance. Find a Washington DC room with a good package attached and you're on your way! If you're after a little food with your rooftop bar, then head to ADC (Above DC) at the Donovan Rooftop Bar on Thomas Circle for stunning cocktails and modern Asian in the form of Zentan restaurant. The pool is warm and wonderful, the view is amazing, the food a tribute to the talented executive chef (Jennifer Nguyen) and the company is top flight Washington. The Beacon Bar and Grill features the Beacon Sky Bar with spectacular views of Dupont Circle, Embassy Row and the city is spread out in front of you, including monuments and Washington attractions. This is a wonderful spot as the sun goes down with lovely views and an excellent selection of canapé style food and an exquisite cocktail list poured with passion! The Cleveland Park Bar and Grill is at 3421 Connecticut Ave and features vast views of the surrounding area and the Cleveland Park neighborhood. Go for the wood-fired pizzas, the simple but delicious salads and the view. This is more your spartan affair rather than souped up glamor. If you're on a short break to Washington with the kids over summer, you will undoubtedly tackle the big three - Congress, the Smithsonian and the White House... but don't forget the need for plenty of exercise and fresh air that kids have too! And the bonus is, with a little exercise, they'll sleep like lambs. Organise your accommodation first though. Go to Cheaprooms.com and find an excellent value Washington hotel room and enjoy the great indoors and the great outdoors in Washington too! Base yourself close to the National Mall area if possible - because this is your prime activity and sightseeing spot. Find cheap accommodation in Washington now and spend your money on your vacation not your accommodation. Give the kids a history lesson as well as gather in some fresh air with a hike up the Mount Vernon Trail. It follows the west bank of the Potomac River from Theodore Roosevelt Island to George Washington's Mount Vernon Estate. The terrain is fairly flat and is paved all the way so the hiking is easy. The views are quite glorious all the way up the Trail; looking out, as it does, over the Potomac and across to Washington's famous landmarks. On your way up the Trail, stop at Arlington National Cemetery and reflect on the sacrifice made by so many. This is a great way to segue into a conversation about the service that many people provide and the 612 acre national cemetery contains the burial sites of so many famous Americans and the final resting place of so many servicemen and women. There are guided tours available, or you're free to explore the site on your own. As you continue on up the Mount Vernon Trail, take time out at Old Town Alexandria. This historic neighborhood dates back to the 18th and 19th centuries and is replete with cobble stones, colonial dwellings and churches, restaurants and museums. Budget and Washington? Dichotomy much? We'll leave the concept of a political budget to others - our concern is more how a family can make the trip to Washington and see all that there is to see for as little as possible. 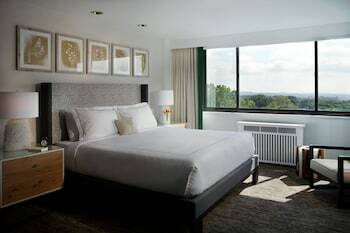 See Cheaprooms.com for quality, well-located hotels in Washington DC. There are hundreds of hotels in Washington to choose from and all are excellent value for money. Many of your activities are based around the National Mall area - so use that as your location guide. There are good deals on Cheap Rooms and the nature of the city means that many of your selections will be close to the Capitol Hill area. One of the best - and cheapest - attractions in DC is the National Zoo. This remarkable public institution really has got its act together over the last couple of years. The Asia Trail, for example, takes you on a conservation journey. You'll see the giant pandas - Mei Xiang and Tian Tian - at play and enjoy their cousins the tiny red pandas. Rock Creek Park is full of stars - but you're a long way from Hollywood. This is the only planetarium operated by the National Park Service and the result is a superbly researched exhibition of the night sky, excellent facilities and knowledgeable staff who are passionate about what they can show you. You really do have to see the National Mall and all its cultural treasures and one of the best ways to do it is to avoid it during the day! Yes, see the Mall at night - and a great way to do exactly that is with a company called DC by Foot. They will take you on a kid-friendly guided tour of all the must see spots and fill your head with facts, fun and trivia. The childish view of Washington! As serious as it all is at times, Washington does have a rather delightful childish side to it - which you and your young travelers are encouraged to discover at your leisure. Check cheaprooms.com to find a central hotel in Washington DC and tour the nation's capital with the kids. 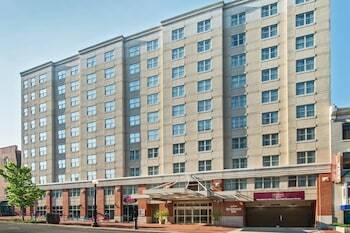 Close to the National Mall area is best because access to the main attractions is easy. 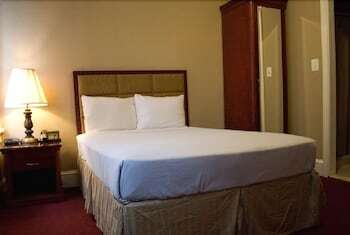 Find Washington DC rooms in the downtown area on our website. There are plenty of bargains to be had, but be quick for the better properties. Washington has a reputation for being a place for grown ups and school trips. But it doesn't have to be! Running the seat of government may well be a serious proposition with an incessant focus on the moribund goings-on of the political elites, but Washington as a family trip with a not-so-serious focus is a lot of fun! In witness thereof; we give you the DC Duck - an amphibious bus that travels the streets and waterways of the capital. Added bonus - you'll get a quacking good run down on historical monuments, historical and sometimes hysterical trivia and a run past many of the nation's major buildings. All kids love a good spy story - adults too at a guess, given the prevalence of spy movies soaking up our time at the present. And what better way to indulge that interest with a super-secret visit to the International Spy Museum. It's got all the good stuff like a replica of James Bond's Aston Martin. You can put the teenagers on a Polygraph test, and they can help crack a safe or two, after crawling through vents to spy on the rest of the family. And if all that earnest learning stuff is just too much, take the kids to the Capital's only theme park. The Six Flags America park is a combination theme park and water park, so on those muggy summer days it provides an excellent space to cool everyone down somewhat. There are seven roller coasters for the intrepid - one of which dates back 80 odd years, as well as a plethora of computer -driven, heart-stopping modern ones. There so much to see and do in Washington you really need a week - but if three days is all you've got here's the inside running on what to do. Check Cheaprooms.com for quality hotels to choose from in Washington. You'll find off season Washington hotel rooms are great value and offer even larger families a good base to stay. Washington is living history for Americans with tours through the White House and Congress delivering a far great understanding of politics and government than a dry text book can ever hope to. Choose a good deal on Cheap Rooms and see some of our greatest institutions of art, culture and government at work. If your hotel is downtown, start your 3-day adventure at the Smithsonian. There are, of course, 19 different museums you can choose from and our recommendation on a tight timeline is the Natural History Museum for the sheer breadth of the exhibits on display. Some of most America's most recognizable monuments are in Washington. Go see them at night when their full visual splendour can be enjoyed without the crowds. The most famous monuments are on the National Mall. Across the Memorial Bridge is Arlington National Cemetery and here's where you'll find the grave site of John F Kennedy, a multitude of others and the Tomb of the Unknowns. Washington is the one city in the entire country where you'll see the Three Houses of Government. Arrange your visits prior to coming and take the children through the U.S. Capitol Building, the White House and the U.S. Supreme Court Building. On your third day, take it a little slower with a walk through historic Georgetown, past the bustling waterfront and through the glamorous shopping boutiques to the many street-side historic sites. The best of Washington - on a budget! Travelling to Dc - and want to experience all that Washington offers - on a budget? Easy! Your first task is to check Cheaprooms.com. They have hundreds of hotels to choose from and the range of discount rooms in Washington will cover every budget. Washington serves well as the nation's capital with a plethora of great attractions and cheap eats - if you know where to go. The good deals on Cheap Rooms will head you in the right direction. Now all you need to think about is food and attractions! The really good news is that all the Smithsonian attractions are free. The Smithsonian is the world's largest museum complex and the individual buildings are open 7 days a week from 10am - 5pm. The National Gallery of Art in Washington is free as well and the collections include Dutch and Flemish, French and Italian masters. Regular exhibitions are held and early American art also features.